Walking along the shore in Sydney's Botanic Gardens you could be excused for thinking that you'd been transported back to Thebes in the Second Millennium BC...no, actually, the Opera House, the Harbour Bridge and Sydney's skyline might spoil the spell. 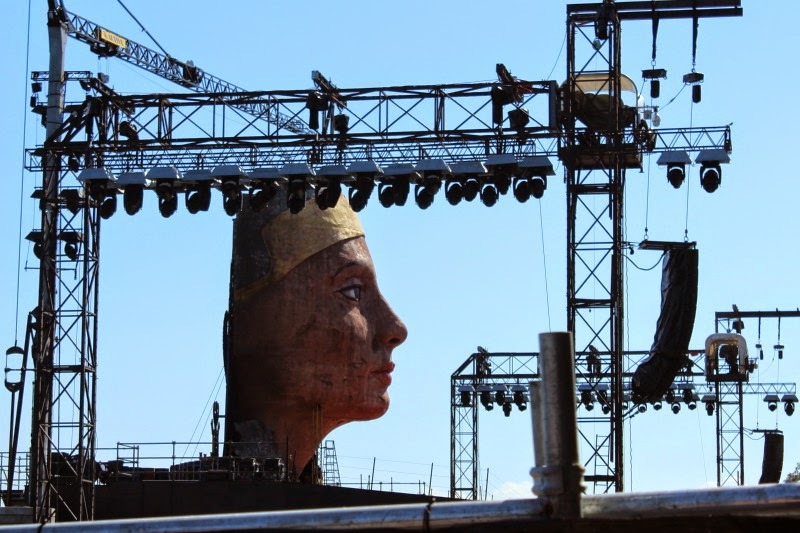 But you couldn't miss the 18 metre tall head of Nefertiti which is the centrepiece of the Handa Opera production of Giuseppe Verdi's grand opera "Aida". Mark Thompson, the wonderful set designer for many productions here and overseas including "Charlie and the Chocolate Factory" and "Noises Off", designed both the set and the costumes for this grand production of "Aida". "Nefertiti" apparently means "the beautiful woman has arrived". The real sculpture of Nefertiti is in the Neues Museum in Berlin where I saw her last year after having only seen her in photos. She was absolutely stunning despite a couple of nibbled ears and an eye that was never completed. The real Nefertiti courtesy of the Neues Museum. The real Queen Nefertiti (1370-1330) was married to the Pharoah Akhenaten, an early monotheist whose memory was largely expunged by subsequent polytheist pharaohs. 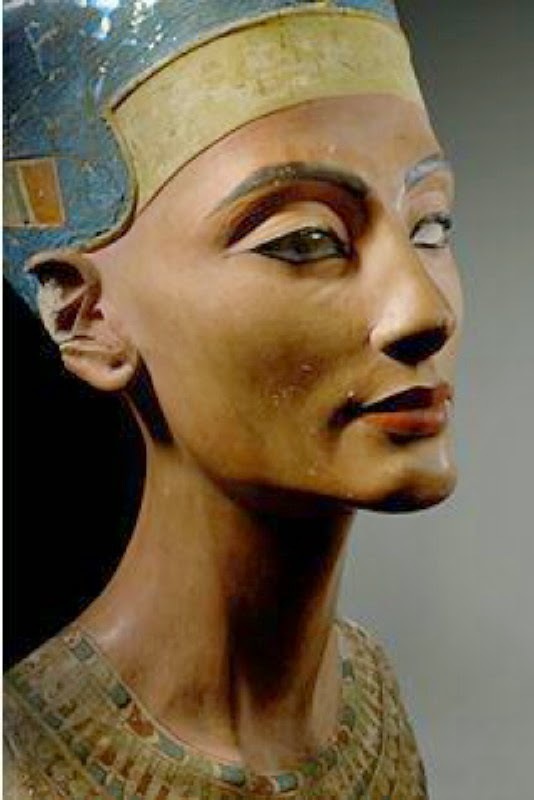 The sculpture of Nefertiti dates from 1340 BC and was found in the sculptor's studio in Thebes much as it is today. The name Nefertiti means, "the beautiful woman has arrived". Allowing for a bit of sculptor's licence, I'm sure you'll agree that the name suited her. In Mark Thompson's colossal head of Nefertiti he has opened up the missing eye as a "window" for the singers. Among Mark's many great and prize-winning set designs none could have been better than the one he did for Monkey Baa Theatre Company's production of the play, "Emily Eyefinger", coincidentally and just in passing based on the Emily Eyefinger books written by yours truly. I just thought I'd throw that in. The third book of the Emily Eyefinger series. And, even more coincidentally, part of that play took place in the upsidedown pyramid of King Inverticheops in Egypt. performances by the brilliant and talented Dannielle Jackson. 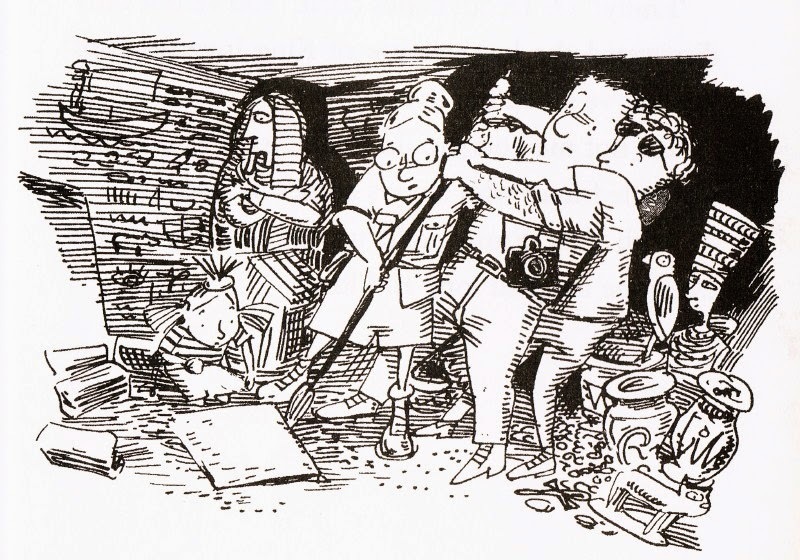 trapped in the burial chamber of the pyramid of King Inverticheops. In one of Craig Smith's illustrations in the book I couldn't help noticing a Nefertiti-like sculpture among the other treasures on the right of the illustration. Could this have been the inspiration for Mark Johnson's "Aida" set? Somehow I doubt it but it's an interesting thought. In the end of the opera, Aida and her lover Radames are sealed in a tomb and sing a wonderful duet as they die of asphyxiation. (Oops sorry, late spoiler alert.) 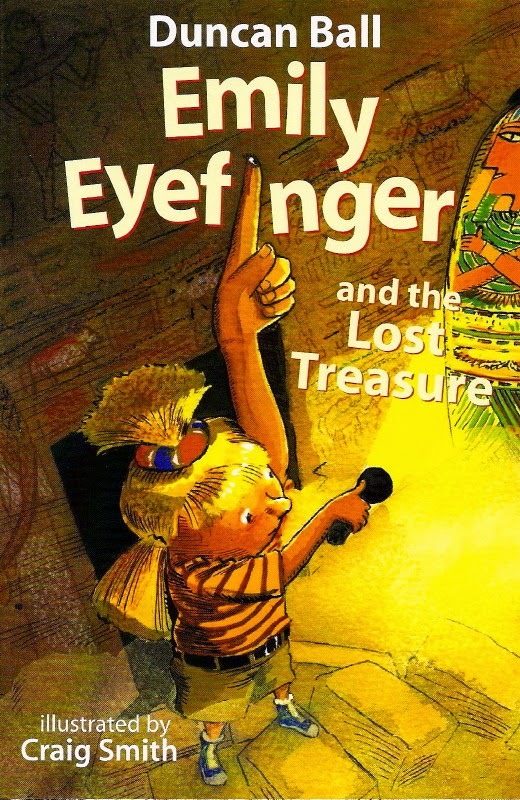 At least in the story "Emily and the Lost Treasure" Emily, her parents and Dr Deddybones escape thanks to Emily's eyefinger. If only Aida had had an eye on the end of her finger she could have survived. Of course then there might not have been an opera. Being trapped in tombs reminds me of Kurt Vonnegut's extremely neurotic character, Eliot Rosewater, who yells out during a performance of "Aida" to Aida and Rademes: "Stop singing and you'll live longer! You're using up the oxygen!" Or words to that effect. Finally, apologies for not having written a blog for over a year and for not answering some excellent comments and suggested corrections from my last two blogs, all that time ago. Click this image to order signed copies of my books. Six of the Selby books are now on sale for $A 4.99 plus postage for Australian readers. This is 11th book in the Emily Eyefinger series. Buy a signed copy from our book store. Monkey Baa Theatre Company's (website) had a great run in 2011 and 2012 with their play based on the Emily Eyefinger books. The play will be on again in various locations around Australia in 2013.